After nearly five months of eating masala dosas, bhel puri, and thalis, I am back to eating…dal, rice, and subjis. Hmmm…okay, so not much has changed food wise, but I am back in the US of A. My time in India was filled with so many wonderful experiences and filled with so many delightful people (India’s best kept secret) that it is hard to find the words to begin. As I begin to type I lose myself out the window…day dreaming…reminiscing of all these newly made memories: uniquely carved temples in Tamil Nadu, the month long Margazhi Music and Dance Festival of Chennai, the street foods of Mumbai, all the sitars, sarods, surbahars, tablas, and musicians of Kolkata, gigs in the Gujarat, and who could ever forget the beaches of Goa. The reason for going to India is the same reason I go anywhere, Music. On this trip and like many of its kind, it is just simply to continue learning ragas from my Guruji, K. Sridhar. Learning music in India is not too far out of the ordinary from learning music in the US or any other place on the planet. I feel other than changing the back drop and adding some mind blowing adventures, it’s the Same! But since we started out in Mumbai, we’ll have to add a few beep beeps and wonk wonks from the streets. My Guruji and I always pick up right where we last left off on this never ending musical voyage. However, the focus of my riyaz on this trip began a new raga, Raag Todi. Raga Todi, is a beautiful morning raga with intense yearning and lots of tension yet while being so serene. The shrutis in this raga are strong and potent and nothing that I have experienced before. Imagine trying to grasp something. The closer you get to it the further away it seems. Then when you are sure it is in you hands, you open them only to find nothing…you look up…and there it is…getting away! Now add heart wrenching passion and that is Raga Todi. It would be impossible to summarize five months of experiences into one blog. So I will leave it here and we can pick up right where we left off 🙂 I do want to thank all that have helped to make my trip possible and to everyone who has hosted me. Without out your love and support, learning and sharing this music would be all the more difficult. Thank you and I am truly grateful! My schedule is currently riddled with more private gigs then public ones. Keep checking the ‘Performance’ page on my website for new programs. With any luck we may have a morning concert so I can share Todi with you. The Answer is: Thursday October 9, 2014 they will all be hanging out with Chris Moore on WQED! The program is called Pittsburgh 360 and it airs at 7:30pm EST. It is safe to say Hindustani music is starting to creep into Pittsburgh via satellites. Next Thursday will be sitars and surbahars. Then what’s next? Kids busking on the streets with sarods and bansuris instead of guitars and flutes. The hum of Raga Hamsadhwani on the train. The wistle of Raag Bhoop on the Bus. Perhaps maybe a few car beeps of Raga Patdeep! I am very thankful and fortunate to have Chris Moore take an interest in what I do. Mr. Moore interviewed me where I first learned about the sitar and Indian Classical music, The Carnegie Library of Pittsburgh in Oakland. Yes, that’s right…one can learn something by going to the library! He brought along a delightful camera man named Walter; and with the help of Miguel from the library, we got busy. It was really pleasant working with these guys. I think we carried on a conversation throughout the whole interview (off camera). Chris is really knowledgeable about current events, local happenings and history. I found him remarkable as he gives a voice to the community where it is needed. You can say he puts a camera where there is no camera. That is why it is extra special to be interviewed by him. As Chris sung out his questions, Walter commenced the camera with at least 50 eyes! Always looking for new shots with an eye on the lens and still able to tip toe around my coffee without spilling it! The interview includes (I think) excerpts from my July 27th performance at the library, a one on one interview, and maybe some embarrassing photos! I really have no idea. I just hope I didn’t flub too many notes during the performance! So be sure to tune in Thursday October 9, 2014 on WQED at 7:30pm EST. Or, http://wqed.org for you Hipster Techkeys. And don’t forget I will be performing October 12th in Pittsburgh. This is a rare chance to do yoga with the Sound of Yoga. If you have ever practiced yoga, you might have put on music to help you concentrate. You might have noticed that deep meditative music feels like yoga. Your friends might even have talked about music with yoga. Well this is your chance to practice yoga to the deep sounds of the surbahar. This instrument is very good at putting your mind into the right state of being. I will also have the sitar with me to add a few delightful melodies to the practice. It is recommended to pre-register to reserve your spot. Space is limited and it is first come, first served, unless reserved! Go to Yoga Digs website for pre-reg info. Lastly, I would like to thank everyone who came out to the Phipps the other day. It was nice to see some old faces and some new and faces. Until next time, I will see you on the Telly! Morning! What’s new you ask…let me tell you! I want to let everyone know about some exciting news…The people of WQED have decided to do a television interview about one of Pittsburgh’s sitar players. Luckily they picked me! I will be interviewed by Pittsburgh’s famous Chris Moore on the program Pittsburgh 360. Mr. Moore will conduct a private interview with me and record the July 27th program at the Carnegie Library of Pittsburgh. You heard that right! My July 27th performance at the library will be televised. How much of it will be televised? You will have to tune in for the details. This is a free event from 2pm – 3pm on a Sunday. I will be performing on surbahar and sitar. They have a café so feel free to come early and have coffee and tea and snacks. And if you feel brave, maybe get there earlier and pick up a book and read it…for the fun of it! There are portions of the Library that even overlook the Dinosaurs Exhibit in the Museum of Natural History. But for the brave and curious with adventure running through their blood…go to the card catalog (a.k.a computer) and look up Indian Classical Music! Or sitar! Or Raga and Tala! Or any books on Hindustani and Carnatic! I did, and ten years later, I am performing in the same building that brought on this love affair. So come on out show your appreciation by being there and taking part in this experience. 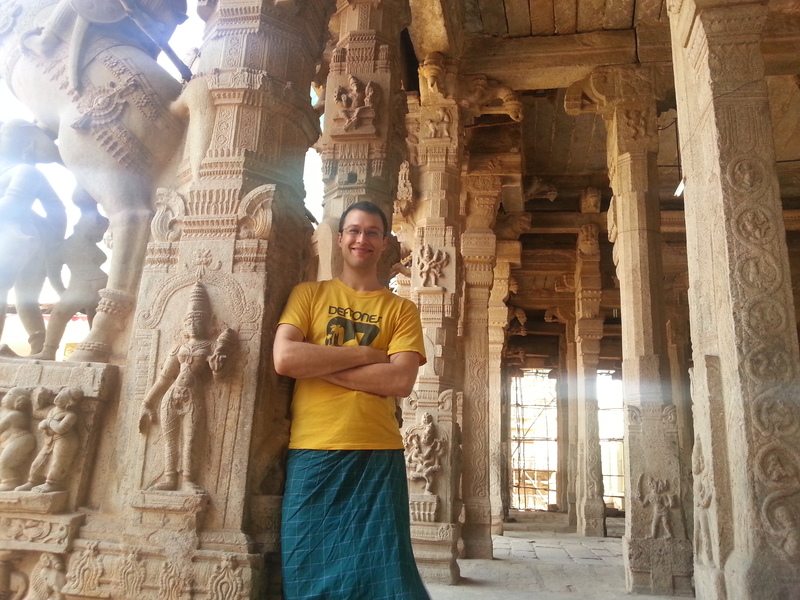 The Library, Indian Classical Music, and I could really use your support. Also, today I will be playing a house concert in Wilmington, NC. Doors open at 7:30pm and the show starts at 8pm. There is plenty of traditional seating (bring a cushion). Anyone in the Triangle wanting to go, we still have some open seats if you want to car pooling. Call for details and address: 910-398-7683 or 412-414-8617. I have 2 shows that popped out of the Blue. This announcement goes out for the Lovely North Carolinians…and any other lovely folks passing through the land of many Pine Trees!!! Then after we have Tea, we will head towards the beach! July 18th I will be performing a House Concert in good’ol Wilmington North Carolina. I will be armed with the surbahar for this one. Since this is a house concert, you will have to RSVP for the address. You can email: michaelgriska@gmail.com or call Angelika at 910-398-7683. I have played here once before and it is a great place for Hindustani Music. This concert I will focus on Dhrupad style Hindustani (deep and meditative) then after the music we will have a Satsang. The Satsang is a question answer that lets us talk about the music. I also want to send my thoughts and well wishes to those in Wilmington. As they just had Hurricane Arthur pass through. Until next time stay safe and don’t forget to listen to good music. Remember, friends don’t let friends listen to bad music! I would like to let you know of a couple of house concerts: April 5th in Wilmington, NC; April 26th in Pittsburgh, PA. Please email me if you are interested in attending, they are RSVP only. These events are donation based, so the price of entry is based on what you feel like giving. Welcome and thank you for taking the time to visit my webpage. This letter is slightly overdue, but arrived nonetheless. As last year withered away and this new 2014 has crept in and taken root, I have been busy shifting music gears from yesterday’s intense riyaz to today’s music performances. Some of my goals for this website are to have literature about the sitar and surbahar and other Indian instruments. 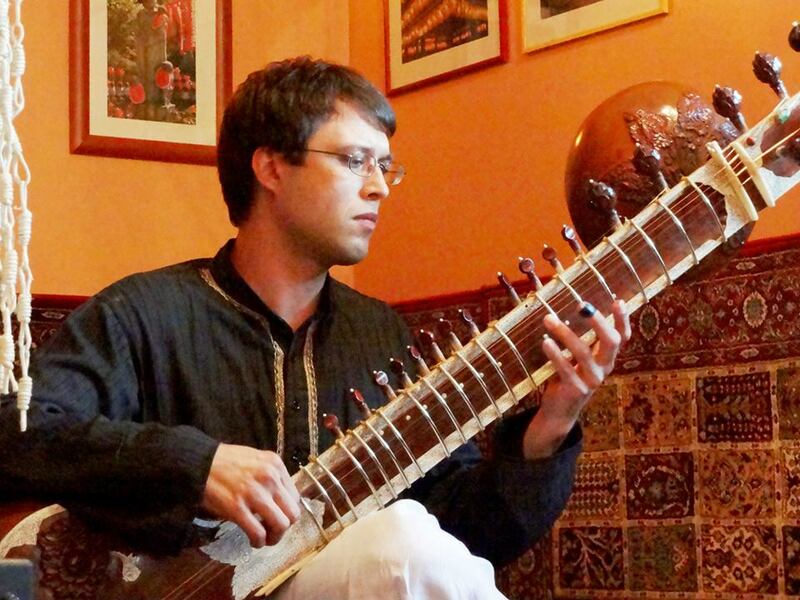 I often get asked how I can learn sitar from a sarod player. Simple I say, my Guruji sings everything! I would like to explain very simply and deeply what a raga “is.” Some people ask why does the music have to be so long. Does the music have healing properties? Where does the music come from? I will give some insight on the history and culture of the music. i.e. Why do musicians in the Northern regions of Indian mention hours of riyaz? Yet, musicians in the South mention hours of sadhana. These things will all come in time. As I have found out, being a musician does not mean just music. It means maintaining a practice routine on top of booking shows, promoting, instrument maintenance, administration and accounting work, travel organization, and there is one thing else…oh yes, performing the music!!! But most importantly, my sadhana is first and most important, all else is second. If you would like to receive emails about future concert details, feel at liberty to sign the mailing list. It is very easy. Send an email to michaelgriska@gmail.com with “Sitar Mailing List” in the subject line. You will also receive a monthly newsletter and information about private house concerts. I hope to see you soon, cheers! Check back for regular news, updates, and information about the sitar and Indian classical music!